Marguerite Radclyffe Hall was born in 1880 at "Sunny Lawn", Durley Road, Bournemouth, Hampshire (now Dorset), to a wealthy philandering father and a quarrelsome mother. Hall was a lesbian and described herself as a "congenital invert", a term taken from the writings of Havelock Ellis and other turn-of-the-century sexologists. Having reached adulthood without a vocation, she spent much of her twenties pursuing women she eventually lost to marriage. In 1907 at the Homburg spa in Germany, Hall met Mabel Batten, a well-known amateur singer of lieder. Batten (nicknamed "Ladye") was 51 to Hall's 27, and was married with an adult daughter and grandchildren. They fell in love, and after Batten's husband died they set up residence together. Batten gave Hall the nickname John, which she used the rest of her life. Under Batten's influence, Hall converted to Roman Catholicism; Joanne Glasgow writes that for Hall and other lesbians of the early twentieth century, such as Alice B. Toklas, the church's erasure of female sexuality offered a cover for lesbianism. In 1915 Hall fell in love with Mabel Batten's cousin Una Troubridge (1887–1963), a sculptor who was the wife of Vice-Admiral Ernest Troubridge, and the mother of a young daughter. Batten died the following year, and in 1917 Radclyffe Hall and Una Troubridge began living together. The relationship would last until Hall's death. In 1934 Hall fell in love with Russian émigré Evguenia Souline and embarked upon a long-term affair with her, which Troubridge painfully tolerated. She became involved in affairs with other women throughout the years. Hall lived with Troubridge in London and, during the 1930s, in the tiny town of Rye, East Sussex, noted for its many writers, including her contemporary the novelist E.F. Benson. Hall died at age 63 of colon cancer, and is interred at Highgate Cemetery in North London. In 1930, Hall received the Gold Medal of the Eichelbergher Humane Award. She was a member of the PEN club, the Council of the Society for Psychical Research and a fellow of the Zoological Society. 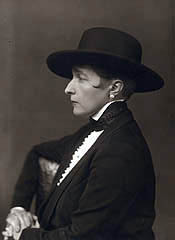 Radclyffe Hall was listed at number sixteen in the top 500 lesbian and gay heroes in The Pink Paper. Verwendete Quelle: Artikel Radclyffe Hall in: Wikipedia, Die freie Enzyklopädie.